The final story-driven DLC expansion for the acclaimed 2011 RPG The Elder Scrolls V: Skyrim by Bethesda Softworks. The Dragonborn expansion takes place on a cold island called Solstheim, located northeast of the Skyrim province. This is The Elder Scrolls V: Skyrim expansion pack. 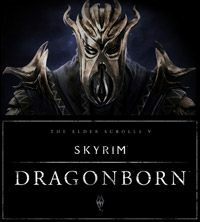 Dragonborn is the third DLC for The Elder Scrolls V: Skyrim, an award-winning and the most popular role-playing game of 2011, released for PC, PS3 and X360. In contrast with the second add-on, entitled Hearthfire, which allowed players to build their own houses and start a family, Dragonborn is a much larger expansion, offering a completely new story, locations, and opponents. The story is set on the icy island of Solstheim, located northeast of the province of Skyrim, also known from the second expansion to The Elder Scrolls III: Morrowind released in 2003. Although over 200 years has passed since players for the first time set their feet on its shores, the people of the land have managed to keep their independence, so the numerous factions from the continent are still fighting for influences here. The story is focused on the mysterious Miraaku character - the first Dragonborn, who fell into madness hundreds of years ago and lost himself in the depths of time. He was endowed with similar skills as the main protagonist of the game, and was able to use dragons for his own purposes. First and foremost, players have to stop the madman from re-taking the power over the island. Dragonborn add-on also introduces many new elements to the gameplay. By far the most important one is the ability to ride a dragon, flying up in the skies. Players can also expect new types of enemies, weapons, powers, and armor, all of which enriches the game. This guide to contains a thorough and checked compendium containing All the information you need on The Elder Scrolls V: Skyrim &#8211; Dragonborn.